Sure, three actors have dropped like flies from the Ant-Man movie, since Comic-Con International opened it's doors, but in the release of this teaser poster, Marvel Studios have taken out one of the Top 5 Hits of the weekend before many other publishers have even stepped up to the microphone. It does this, by reminding us all in a single image, what makes a comic (in either film and print) so amazing in the first place; a little bit of crazy, lots of imagination, and a hero brave enough to combine the two. 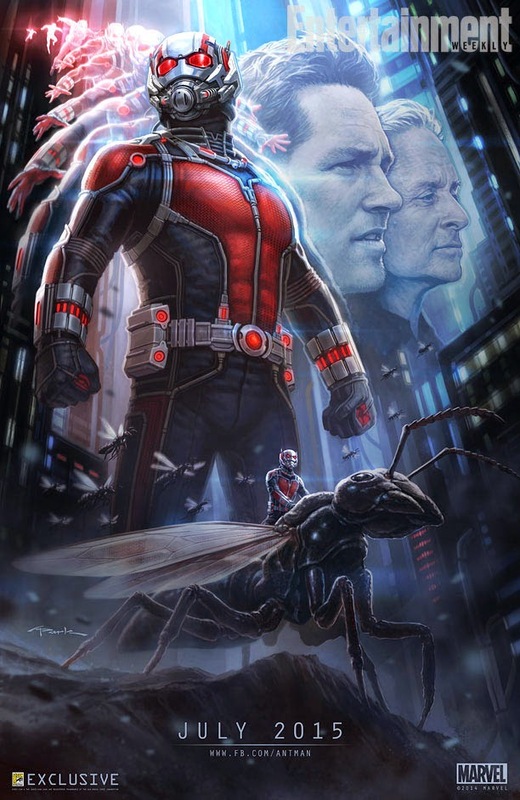 Sure Ant-Man is one of Marvel's oldest heroes, and one of the true founders of The Avengers, but for your average Joe Bloggs Mainstreamer, this poster heralds nothing more than the fact the House of Ideas next gambit is a size-variable hero who can tower above cities one minute, and ride ants into battle the next. In a time where too many concepts try to bury the silver-age or even golden age aspects of their heritage, to appear 'realistic' or to be 'taken seriously', this Ant-Man teaser shows you can survive installing a sense of 'what if' and 'wow' and live to tell the tale. Here's hoping Ant-Man comics, if not comics in general rise to do the same before the film debuts July 17, 2015. I want to be hyped for this- I really do... but the departure of Edgar Wright just leaves too many doubts. I desperately wanted to see Edgar Wright's Ant-Man. Marvel's Uniform Corporate Conglomerate Ant-Man... not too much. That's a good point King - seems creator freedom may be just as rare in films as it is in the comics that inspired them huh? Well, it's always been rare in films- but this just seems doubly-so. I didn't like Michael Douglas being the old(er) Antman. Maybe it would've been very good, but who knows know that it's in movie limbo land.